Just Movie Posters Blog | A blog about movie posters, collecting & pop culture as it relates to the movie industry. At a recent Coachella concert, a holographic image of the late rapper Tupac Shakur was displayed on stage with Snoop Dog. Of course, the audience loved it. Still, it was just an image, it wasn’t the real thing. As you can guess, that got me thinking. If it were possible to bring back dead actors and actresses, who would I like to bring back? Well…. Yes, the great Kate. Her obituary in the July 6, 2003 issue of Time stated that “…A new actress might be called a Marilyn Monroe type or a Drew Barrymore type, but there was no Kate Hepburn type. There was only Kate Hepburn.” How true. She was feisty, smart and she didn’t just play an independent career woman, she was one off-screen. After all, in 1940 she bought the rights to the play The Philadelphia Story, as well as starred in the film. Remember, this was a time in Hollywood when the studios called the shots on their employees. Yet, she thrived being who she was, which is all the more reason to bring her back. She could star in a film where she mentors a young female college graduate how to navigate life (and love) after college. It would be the opposite of The Devil Wears Prada and a welcome change of pace from all the girl loves man-child films out there. Another great from Hollywood’s Golden Age. Of course, it is obvious that he would play George Bailey again and this time he would be dealing with the mess left behind by the mortgage foreclosure crisis. Then again, you could put him together with Katherine Hepburn. After all, they starred in The Philadelphia Story together. They could be in a sequel of sorts to that film where they deal with a new generation of rich soon-to-be marrieds and show them that feistiness and love doesn’t end at age 45. Of course, how could he not be brought back. He left this world much too soon when his career was so full of promise. Had he lived, would he go on to bigger and better things or would he flame out, as director Elia Kazan said he would in his autobiography. Well, there is only one way to find out and that is bring him back and have him star in some movies. He could be cast in a Western or maybe a Romantic Comedy. I think he would do very well in a Western, even get an Oscar nod and the rom-com would be fun to watch. Of course, this is all speculation on my part. I certainly don’t have the ability to bring people back to life. So, if you should see a dead actor or actress walking around, chances are that person is just an impersonator or just playing that particular actor or actress in a film. Well, it is not a secret that Hunger Games is a hit with moviegoers. It made over $152 million it’s opening weekend, which made it the best March movie opening ever. This film is based on books by Suzanne Collins where, in the future, young people are forced by the government to fight each other to the death. Of course, this is not the first time a book or book series got the movie treatment. Just look at the recent John Carter of Mars, those books are classics of the science fiction genre. Written by Edgar Rice Burroughs, the man who brought us Tarzan, it deals with the adventures of the title character, a prospector and U.S. Civil War veteran who ends up on the planet Mars in the 21st century. Yet, John Carter didn’t do nearly as well its opening weekend. How much money did it make? Only $30 million. By the way, John Carter of Mars cost $250 million to make, whereas Hunger Games only cost $78 million to make. What gives? 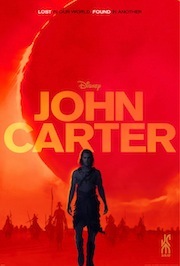 John Carter has been around for almost a hundred years, it was written by the same person who gave us Tarzan (how many screen adaptations did he get) and has a big fan base. In addition to all of that, the film version was directed by Andrew Stanton, the guy who directed WALL*E and Finding Nemo, it had the good special effects and had the resources of Disney studios. Why didn’t it do as well as Hunger Games? Here are my thoughts. While books are considered classics in the science fiction genre, they aren’t in the same league as books by Jules Verne. Verne was an engineer, so his stories had some grounding in science. Edgar Rice Burroughs was a pencil sharpener salesman, among other things and he achieved his greatest success by writing the John Carter stories. The appeal of Burroughs’ John Carter stories has more to do with characterization, (John Carter is noble, the Tharks are savages, etc.) than with any visions or predictions of the future. I have a passing familiarity with the books because my brother read both the Marvel comic book version and the actual books. If you haven’t read the books or know someone that did, looking at a poster like this would make you scratch your head. There was no mention that this was based on the books by Burroughs. The blurb on the poster doesn’t draw the moviegoer in. (FYI: The blurb says, “Lost in our world. Found in another.”) Not even a mention that the person who brought us WALL*E and Finding Nemo was directing this film. Marketing campaign seemed to be “If you film it, they will come.” Well, they filmed it and only $30 million’s worth came. Sometimes, no matter how many pluses a movie has, and this film had plenty, it just doesn’t do well. Classics like Citizen Kane and It’s A Wonderful Life bombed when they were first released and you can’t get better plusses than Orson Wells and Jimmy Stewart. Not to mention, the John Carter books are a hundred years old, so they didn’t have the marketing machine behind them that a more recent book, like Hunger Games or Twilight has. So, if something in your life doesn’t work out, no matter how much thought or effort you put into it, don’t feel too bad. At least you didn’t lose $165 million on your endeavor, which is what Disney stands to lose on John Carter.